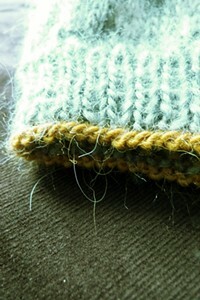 These days I struggle to write eloquently about what I am knitting. It used to be that I could snap a photo, link to a pattern and wax lyrically about the process. As I now tend to design my own patterns and work on things that will not be unveiled for another six months .. well, it kills the sharing bug a bit. But let's see if I cannot circumvent the whole "cannot show & cannot tell" thing. Pictured: a hat. This hat design (along with the matching fingerless gloves) was the first design I sketched when I started working on my Doggerland collection. It sums up the whole collection for me: a controlled colour palette, very clean and geometric lines, and that little hint of the natural world to it. I am knitting the sample in Rowan Creative Focus Worsted. I set out to design Doggerland using yarns from the North Sea/North Atlantic region but I could not resist the wonderful light grey - Nickel sh 401 - when I saw it. The CFW also had two other colours that were exactly what I wanted, so even though all the other Doggerland designs will be knitted using local-to-me yarns, this hat & gloves set will be slightly different. On the plus side, it should be easy to find local-to-you substitutes with a worsted weight. I should finish the hat this week and begin work on the gloves. After then I will start to work on a mini-collection in collaboration with a well-known indie yarn dyer. I cannot say much more at this point - mostly because we are still working out the finer details. So, I am kept busy. But I do find time to work on something that has nowt to do with collections. 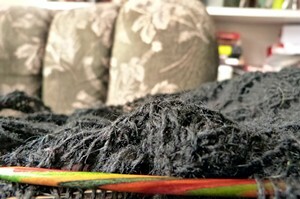 This is a little black shawl which may or may not end up a free download. I have been knitting it at knitting groups lately as it is marvellously portable. I am using Lopi Einband, a fantastically sticky and rough-and-tumble lace yarn from Iceland. I bought in Denmark some three years ago and I never really knew what I wanted to make with it as it is not your standard soft, drapey lace yarn. So, it is now becoming a straightforward triangular shawl with easy pattern repeats and chevrons (I am currently obsessed by chevrons). I don't expect the shawl to be finished anytime soon as it's just a for-pleasure knit. Finally, a big congratulations to Vivienne who won the copy of Coronation Knits from my give-away. Huzzah!